The central theme of this work were investigations of „soft“, secondary interactions in nucleophile-electrophile systems and their characterization by NMR, FT-RAMAN and x-ray crystallographic analysis. The research scope of this work is part of the core research areas Chemistry of the Semiconductor Elements and Supramolecular Chemistry of the work group Prof. Dr. W.-W. du Mont, Institut für Anorganische und Analytische Chemie, Technischen Universität Braunschweig. 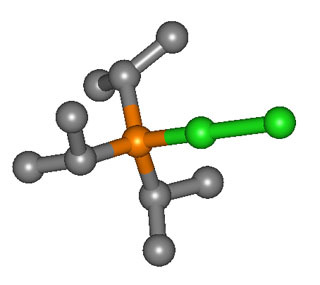 The illustrated structures are rather simple but typical and interesting results from the halogenation of trialkylphosphanes and phosphane-selenides. A section from the x-ray structure of iPr3PCl2*CH2Cl2 (Triisopropyl-chlorophosphonium-chloride-dichlormethane-solvate, JUDAS). 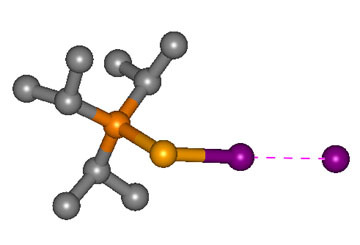 The chlorine-chlorine contact is not a full blown covalent bond but a typical „soft“, secondary ion-dipole-interaction (F. RUTHE, W.-W. DU MONT, P. G. JONES, J. Chem. Soc., Chem. Commun., 1997, 1947-1948.). This entry was posted in Alchemy and tagged Chemistry, X-Ray by admin. Bookmark the permalink.